Uncategorized – DuMor Water Specialists, Inc.
"We like the Kinetico Water System. It saves money and time. It uses little salt." "We love our Kinetico water softener. We don't have to recharge it. We have cleaner and softer clothes. It doesn't take as much soap to do laundry. My husband's hair is softer. The kitchen sink stays cleaner longer. No more hard water build-up on the dishes. We would not want to be without our softener." "Having tired a number of different water softener and purification systems over the course of the past ten years. I have not found one better suited to our needs than the system I am currently using from DuMor. 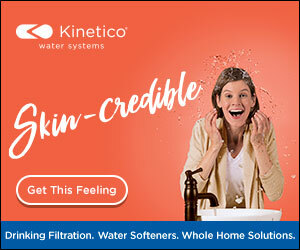 The Kinetico system has no trouble keeping up with the demands of our family of five and has never disappointed us with substandard water quality. At our residence we unfortunately do not have the greatest quality well water and for years had to utilize bottled water for everything from drinking to cooking. The great tasting water free of impurities and no longer have to rely on bottled water and have used substantially less salt than was required with other systems. Overall, I would recommend a Kinetico system to anyone who has tried another softener system and has not been satisfied with results. DuMor has always impressed me with their service and professionalism." "The water test they did in my home was very educational and the salesman, Jason, did a great job explaining what's in my water and how the water softeners function. He was also very personable, not pushy at all and helped me find the best softener for my home that fit my budget." "After purchasing a lake home with very hard well water, I called DuMor and a couple other water softener companies. I choose DuMor because of the prompt response and the professional approach to educating me about my water. Scott was thorough, patient, and knowledgeable about water chemistry. I did not feel pressured to purchase and I felt grateful to be educated about my water and the options for the best water treatment for my family's needs. I was able to ask questions for clarity and felt totally understood. Another bonus is that Scott was always accessible by text and phone. I am totally pleased with my system and highly recommend this company and Scott to others."